Are AGS must-hit-by jackpots gaffed? First, let me explain what a "Must-hit-by" jackpot it. It is a progressive jackpot that starts at a certain amount and must hit by a specified value. For example, in the picture I just posted, the Major must hit by $5,000 and the Minor one by $500. I have a whole page about the mathematics of them here: Mystery Progressives, which is what I called them at the time of writing. Today, most people seem to call them "must hit by" jackpots, which I will defer to for this thread. Briefly, the way I assumed they worked at the time of writing that page was a trigger point was randomly chosen between the starting point and must-hit-by point. The probability distribution I assumed was uniform, meaning every possible value had the same chance. With the introduction out of the way, I have heard from a few sources that such games by AGS deliberately don't let the jackpot hit until very close to the "must hit by" point the vast majority of the time. There is a good post about this at Advantage Play Slot Machines, which, by the way, is a very good site. That post claims that for jackpots that "must hit by" $5,000 rarely hit below $4990. * Somebody has claimed there is no such AGS game by this name. I will return to verify the name of the machine. I welcome any other evidence for or against this theory that AGS must-hit-by jackpots rarely trigger until nearly at the must-hit-by point. The question for the poll is do you agree with the statement above? Related thread: MUST HIT BY JACKPOT MATH QUESTION. Mamat said they're rigged like this, that's all I need to know. 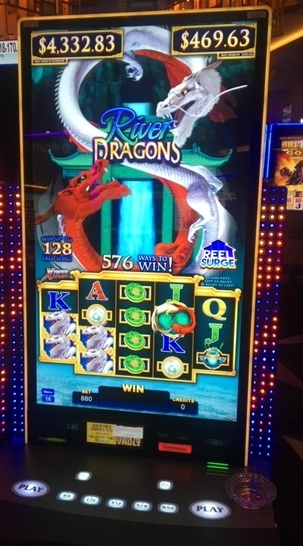 Even if true, does that really mean they are "rigged" any more than another slot machine that is "rigged" to only pay out 90-cents of every dollar bet? If one were to say this game can hit at any point, it's misleading and incomplete, knowing(truthfully safely assuming) they're heavily biased to go very, very late. The other style is considered fair, so this style must be considered unfair. This style is almost a con game, because the game is taking advantage of people, not the math. As the risk of running afoul of regulations here, a former valuable poster has done a lot of research on these and is able to further validate your findings. I dont think rigged is the right word but it appears hitting these before $4990 is like hitting the lottery, so there is a chance to keep the machines legal. It might even be rare before $4999. Not taking sides and totally understand the Wizards position based on history, but sometimes forgiveness is possible in the Holiday season. Or the belief anything can happen is what makes Christmas special for some of us. This makes no sense unless you mean you're passing on a message from a former poster. You didn't say they were banned, or whom it was, so I think that's ok, but I'm guessing it's Mickey Dee's Brother's Grimm if you can't read between the lines, which is also ok for me to say, because I'm being vague and cryptic. You really should lay off the water bottle. Not passing anything on, only stating facts about research I have observed. Knowing Mickey, yea Mickey like I do he probably would give me hell for even bringing it up. He knows why he was banned here, and never thought he didn’t deserve it. But your post seems to match your recent pattern of pure nonsense. I miss the old 1.05miracle of the early 2000’s hanging out with the Golden Greek trying to beat Stinking Rich with the other Meet and Greeters and dreamers. I think it is misleading to say something like, "This jackpot will hit between $2,500 and $5,000," when there is almost no chance of it hitting below $4,990. I admit there is no rule they are breaking, but it just doesn't seem kosher to me. To make a comparison, suppose your favorite restaurant has a jar full of prize tickets. They claim it has 9999 losers and one that wins a car. For every paying visit you get to draw a ticket. With only 500 tickets to go nobody has won the car, so people are induced to eat there, for the 1 in 500 chance to win the car. However, the owner deliberately hides the winning ticket until there are only 50 tickets left and then slips it in. Wouldn't you feel a little cheated if you ate there because of the drawing when the jar was down to 500 tickets? BTW, I get this example from an episode of Alice. Rest In Peace Vic Tayback. This is a personal insult.